1 of 3 Heat oven to 400 degrees F. Heat 1 tablespoon of the oil in a large nonstick saute pan over medium heat. Add onion and celery; cook 5 minutes. Add garlic; cook 1 minute. Pour in another 1 tablespoon of the oil and add eggplant; mix well and cook 5 minutes. Add tomatoes, tomato sauce, vinegar, raisins, pine nuts and capers. Cook 5 minutes, then reduce heat to medium-low and cook 10 more minutes. Stir in 1/4 teaspoon of the salt and 1/8 teaspoon of the pepper. 2 of 3 Meanwhile, place cod fillets skin-side down on a rimmed baking sheet lined with aluminum foil. Brush with remaining 1 tablespoon oil and season with remaining 1/8 teaspoon salt and remaining 1/8 teaspoon pepper. Bake at 400 degrees F for 12 to 15 minutes or until fish flakes easily with a fork. 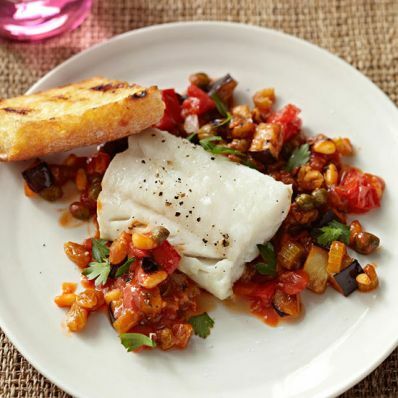 3 of 3 Serve cod with eggplant caponata. Garnish with chopped parsley and serve with toasted baguette slices, if desired.